Let’s divide decimals by decimals. Use long division to find the value of $5.04 \div 7$. Which of the following quotients has the same value as $5.04 \div 7$? Be prepared to explain how you know. Think of one or more ways to find $3 \div 0.12$. Show your reasoning. Find $1.8 \div 0.004$. Show your reasoning. If you get stuck, think about what equivalent division expression you could write to help you divide. Do you agree with Diego’s statement? Use the division expression $7.5 \div 1.25$ to support your answer. Can we create an equivalent division expression by multiplying both the dividend and divisor by a number that is not a multiple of 10 (for example: 4, 20, or $\frac12$)? Would doing so produce the same quotient? Explain or show your reasoning. 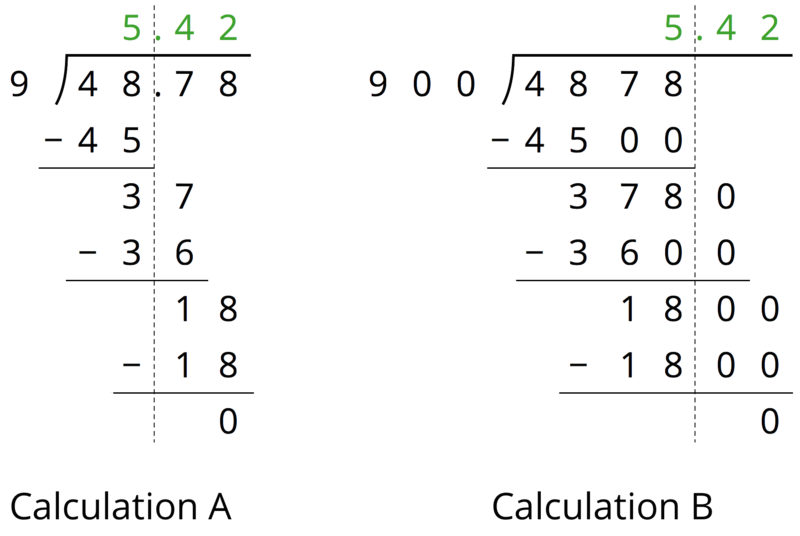 Here are two calculations of $48.78 \div 9$. Work with your partner to answer the following questions. How are the two calculations alike? How are they different? Look at Calculation B. What do the 3600 and 1800 mean? We can think of $48.78 \div 9=5.42$ as saying “there are 9 groups of 5.42 in 48.78.” We can think of $4878 \div 900=5.42$ as saying “there are 900 groups of 5.42 in 4878.” How might we show that both statements are true? Explain why $51.2 \div 6.4$ has the same value as $5.12 \div 0.64$. Write a division expression that has the same value as $51.2 \div 6.4$ but is easier to use to find the value. Then, find the value using long division. Find each quotient using a method of your choice. Then discuss your calculations with your group and agree on the correct answers. If someone in your group makes an error, stop and help that person revise their work. If your group is unsure about an answer, consult your teacher. Mai is making friendship bracelets. Each bracelet is made from 24.3 cm of string. If she has 170.1 cm of string, how many bracelets can she make? Explain or show your reasoning. One way to find a quotient of two decimals is to multiply each decimal by a power of 10 so that both products are whole numbers. If we multiply both decimals by the same power of 10, this does not change the value of the quotient. 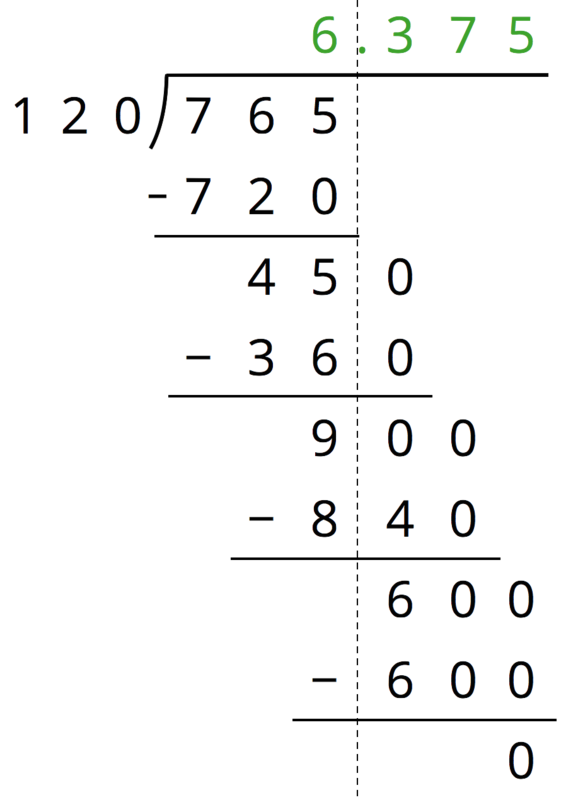 For example, the quotient $7.65 \div 1.2$ can be found by multiplying the two decimals by 10 (or by 100) and instead finding $76.5 \div 12$ or $765 \div 120$.